That’s right, just after a few tears, both kids tolerated the flu vaccine and the 2yo even let the nurse giving the injection hold her, and waved good bye to everyone with one hand, holding onto her prized pouch (only for outings) in the other hand. 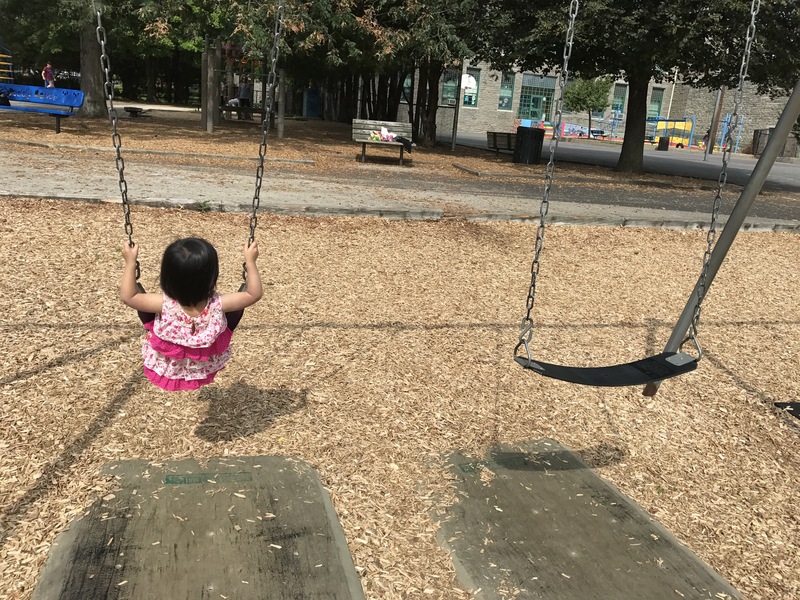 (Sometimes a kids’ reaction reflects the parents’ behavior, and myself being very matter of fact about it, my kids moved on very quickly to more important matters like food.) I get the flu vaccine every year also. Of course get the flu vaccine for almost everyone 6 months and above, and get it early because it takes 2 weeks for the vaccine to fully activate the body’s immune system to respond to an infection. The very smart scientists at the CDC have done the research, and I trust them and the data. The flu vaccine prevents death. I work WAAAYYyy too hard at trying to keep my patients healthy, then to let a preventable illness get them down. 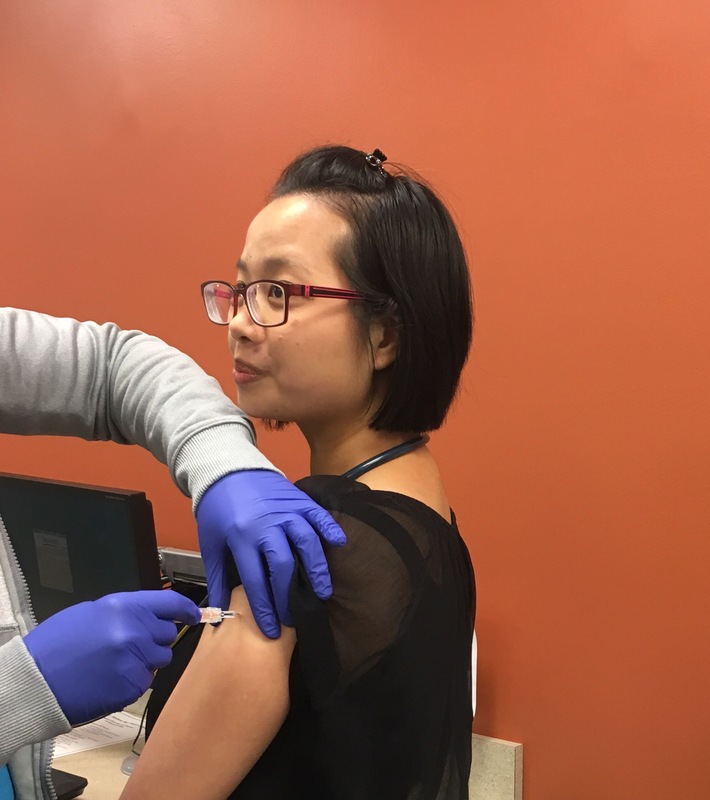 Getting the flu vaccine DECREASES risk of influenza-associated death by 65% in healthy kids, and by 50% in kids with severe medical problems (CDC). Don’t throw away your shot! Why is influenza so dangerous? 80-85% of kids who die from influenza-related illness did NOT get the flu vaccine (CDC). The flu virus is like a Trojan Horse (see here for a refresher on Greek history). Being sick from the flu alone is annoying – feeling tired, nauseous, achy, weak, missing work or school for 1-2 weeks) – but whatever, life moves on. HOWEVER, the flu virus can lead to complications such as severe breathing problems or make it easier for bacteria to infect the body. The bacterial infection can then lead to severe infections in the bones requiring amputations, in the lungs, or in the blood vessels or brain leading to death. No thanks to that! What’s NOT in the flu vaccine is a live virus, which means no way someone can get sick “from” the flu vaccine. It’s possible to catch a cold while in the pharmacy or doctor’s offie getting a flu vaccine but not from the contents of the injection. The flu vaccine contains 3 or 4 strains of inactivated influenza viruses. It also includes formaldehyde to keep the flu viruses inactive. This chemical is naturally found in pears and normal metabolic processes in humans. The amount needed to be toxic to a human, one would need to get over 10 million flu shots in ONE day. The flu vaccine (and many other vaccines) also contains small amounts of aluminum to boost the efficacy. Aluminum is found in much higher quantities in food packaging, fruits, veggies, infant formula, body products like deodorants (CHOP website for extended list). Other ingredients of the flu vaccine include gelatin (also found in candy, pork), very very small amounts of egg protein (because the virus is replicated in a fertilized chicken egg first), and antibiotics (to keep bacteria out of the flu vaccine). Who should NOT get the flu vaccine? Kids younger than 6 months should not get the flu vaccine. Also, people who have had a severe allergic reaction (generally a combination of problems breathing, throat swelling, blood pressure drop, fainting, weakness/paralysis, and/or vomiting/diarrhea) to any component of the flu vaccine such as gelatin, eggs, etc (see here for a complete list). These people are as rare as 1.35 in 1 million flu vaccine recipients (source), and most of those cases were NOT related to an egg allergy. I usually have kids come back for the flu vaccine if they feel very ill or are starting on a medication or other treatment, just to avoid confusion if further symptoms or an allergic reaction does develop. I categorize feeling very ill as having fevers, chills, achy, but a little runny nose and cough is usually okay since most kids are snotty all winter anyway. The benefit and protection of the flu vaccine seems to far outweigh the risk of death and complications from the influenza infection. Do it. Every year. My general disclaimer as usual, this is not medical advice. Please discuss and consult your doctor or your child’s doctor to formulate a treatment plan for your child. Call your doctor with any questions or concerns. Subscribe here for email notifications when a new Betamomma.com post is released!